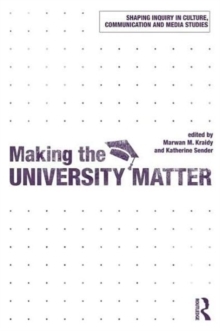 Making the University Matter investigates how academics situate themselves simultaneously in the university and the world and how doing so affects the viability of the university setting. The university stands at the intersection of two sets of interests, needing to be at one with the world while aspiring to stand apart from it. In an era that promises intensified political instability, growing administrative pressures, dwindling economic returns and questions about economic viability, lower enrolments and shrinking programs, can the university continue to matter into the future? And if so, in which way? What will help it survive as an honest broker? What are the mechanisms for ensuring its independent voice? Barbie Zelizer brings together some of the leading names in the field of media and communication studies from around the globe to consider a multiplicity of answers from across the curriculum on making the university matter, including critical scholarship, interdisciplinarity, curricular blends of the humanities and social sciences, practical training and policy work. The collection is introduced with an essay by the editor and each section has a brief introduction to contextualise the essays and highlight the issues they raise.